The use of industrial robot applications has grown drastically, and with it came development of these robots into more specialized tasks. The need to have different types of robots to perform different tasks brought about the creation of articulated robots. Articulated robots are basically robots with a number of joints which enable it to maneuver around an object which is being manufactured. It is possible for an articulated robot to have limbs such as arms and legs, but it is also possible to have a robotic arm or robotic leg to be either articulated or non-articulated. A palletizing robot which is used for loading can also be articulated. Industrial robots, which are the most common, have grown from performing basic tasks to performing more complex tasks over the years. Once it was realized that there is great potential to create more profit from using robots, the popularity of articulated robots grew drastically. 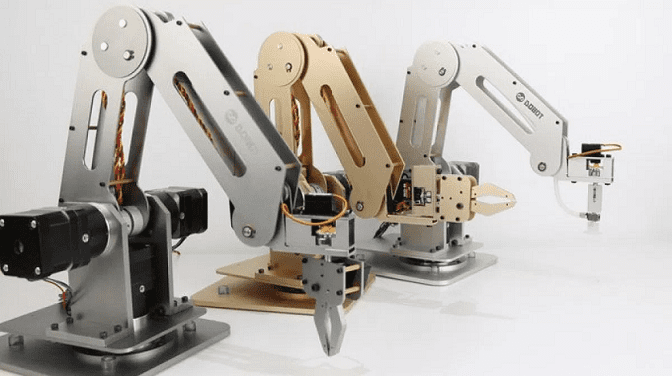 Evidently, using an articulated robot will bring about the manufacturing of better products, due to the efficiency with which articulated robots work. They have managed to get to the top of industrial robots being put into use for manufacturing due to their great flexibility. This flexibility allows the process of manufacturing to go much faster and as seamless as possible, compared to non-articulated robots. With the great benefits which are associated with articulated robots, one would worry about the prices needed to acquire them for their companies. However, they are much less expensive than one could imagine. Manufacturers have found that the development of affordable robotics and automation, is one that is not only valuable but also greatly needed if they are to keep up with the chain of supply and demand. The beginning of articulating robots was made difficult by the high costs of manufacturing, as well as the dexterity involved. The production and growth of these articulated robots was therefore quite slow at first, because of the lack of advanced tools which we are advantaged to work with today. Much to our advantage though, articulated robots are more developed and versatile, therefore it is possible to make up for losses experienced during their pre-existence stage. The available axes on the current articulated robots are quite sufficient, but there could be endless possibilities if more axes were made available on their joints. Usually, most of the common systems of articulated robots have about four to six axes. And even with the small available number, the freedom in terms of degrees when it comes to these robots is actually more than any other kind of robot that exists in the industry. This in turn increases diversity and the functions which it can perform. This includes quite a number of different dispensing, welding, material removal and material handling applications. Consequently, there is a need of more articulated robots to be manufactured, in order to suit the needs of the fast growing economy. Even though there are only four to six axes on the automated systems, there is a potential for ten axes to be accommodated on the same articulated robot. This means that its ability to take on so much of the already existing work load can be improved. If this happens, then the whole manufacturing process can take a turn for the best. Due to improved speeds and accuracy, the productivity of a company can be improved greatly, and in turn the products being manufactured will be improved. Articulated robots have a longevity that is not experienced with other types of robots, which is why they are the most preferred and used in industries. This popularity has caused their prices to go down significantly, and their advantages are endless. Some of which are; they can easily be aligned on to a number of planes at the same time, the can be redeployed easily for molding automation as well as plastic injection and they are very simple to maintain and operate. Evidently, articulated robots need to exist in greater quantities.